Bejeweled metal alloy boxes for trinkets & small jewelry, painted exhaustively by hand with multi-color enamels to an extraordinary level of precision. Each enamel box is hinged, using a magnetic closure to prevent accidental unfastening. 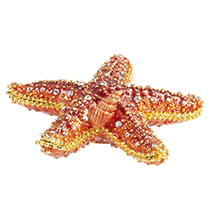 Bejeweled red starfish with life-like texture and small red shell. Hand painted on heavy-weight metal alloy with gold metallic lining, opens in half to reveal compartment for small jewelry. Bejeweled blue starfish with life-like texture and small blue shell. Hand painted on heavy-weight metal alloy with gold metallic lining, opens in half to reveal compartment for small jewelry. 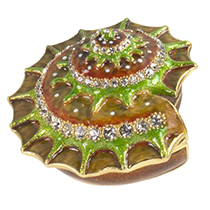 Bejeweled spiral sea shell. Hand painted on heavy-weight metal alloy with gold metallic lining, opens in half to reveal compartment for small jewelry.